Traveling in Greece? To find out what your home currency is worth in Euros, or any other currency, use a currency converter: The currency used in Greece is the Euro. OANDA powers many currency converters on the Internet. Their home page defaults to the U.S. Dollar to Euro conversion, but other currencies can be easily selected from the drop-down menu. Any amount of dollars and euros can be selected. Here's another converter you can use. Scroll down to select your currencies, which are alphabetically arranged. The Dollar is under 'United States Dollar' and the Euro is just under the 'Euro'. An unfavorable exchange rate is one thing. Conversion costs are another. Generally, the traveler will encounter any or all of several types of fees while converting dollars to euros and euros to dollars. Each of these methods has its own advantages and disadvantages. At the Airport - Currency exchange offices profit two extra ways - they don't give you the best available rate and they charge a hefty fee - sometimes as much as 5%. A dying breed with the advent of ATMs everywhere and the dominance of the Euro, but you may run across one of these. You put in your own currency, it whirrs around for a moment, and out pops an amount of Euros. It can't be called an equivalent amount since it too is subject to a fee - which may be just hidden in a less-than-generous exchange rate. Usually, the cheapest way to get euro currency is by using your ATM debit card. The banks will process it immediately at a good rate. However, you will still be paying an ATM transaction fee, and more and more banks may charge an extra fee for an international transaction. You will usually get a more or less favorable base exchange rate if you use a credit card, but on top of that you will immediately incur interest charges on most credit cards - there is no grace period on cash advances. And, usually, the interest rate on cash advances is much higher. It's not unusual to have a card in your a wallet that is at a 0% introductory rate on purchases - but at a 23.99% interest rate on cash advances. It doesn't end there. There may be a credit card transaction fee on top of this, and, finally, just for good measure, a fee for using the ATM. On the bright side, a few newer credit cards are reducing fees on international transactions, having finally noticed that international travelers tend to use their credit cards a great deal, and may be interested in perks which make international transactions more affordable. Shop around for the best deal on international purchases and cash advances if you travel frequently. Need to convert currency? Remember Greece is now using the Euro for all transactions since the formal demise of the drachma back in 2002. 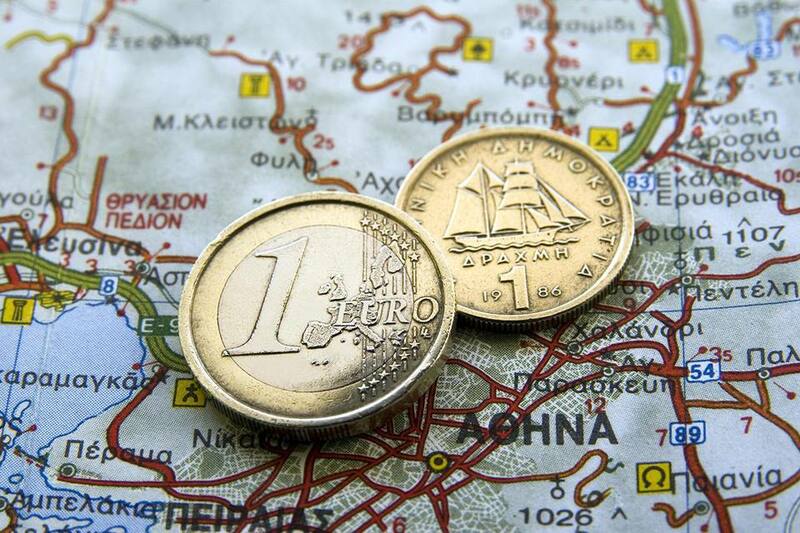 Those old drachmae in a drawer will not be of any use to you in Greece today, so leave them at home. You'll need Euros now... unless the Greece financial crisis ends with an exit from the Euro and a return to the drachma. What Was a Drachma Worth? If you're trying to calculate what an old price in drachmas is equivalent to now, compared to Euros or another currency, the drachma was fixed at a value of 345 drachmas per Euro when the transfer to the Euro system occurred. If something is now 10 €, it would have, in theory, been priced at 3450 drachmas in the old days. In reality, many uneven prices in drachma were rounded up to match handy higher amounts in Euro currency; the prices of beer and other alcoholic beverages seem to be where most travelers feel this effect most strongly. If you think you're feeling the pinch of the conversion from drachmas to Euros, the Greeks have lost a tremendous amount of purchasing power as prices have risen in Euros on basic commodities. Some say this loss in real spendable income since the conversion is nearly 30%. This may not make you feel better about the exchange rate, but the Greeks share your pain, too.